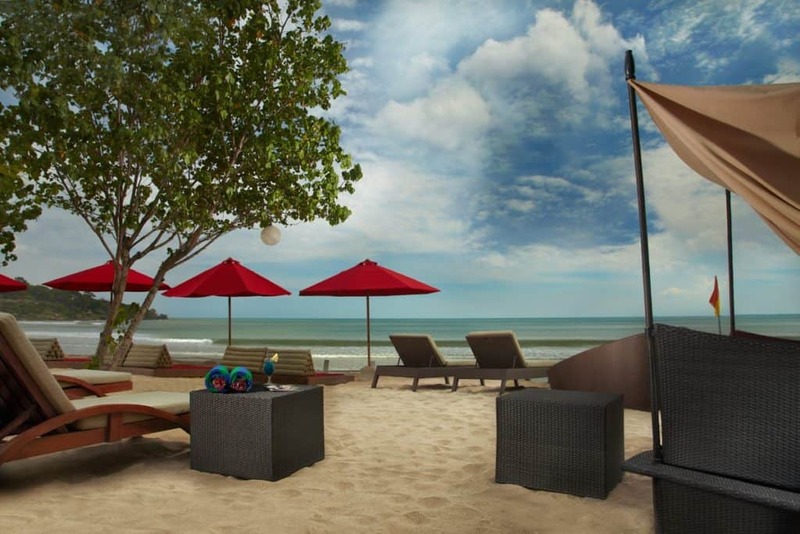 Jimbaran is a quintessential seaside town in Bali and you will find golden sands that lead to limestone cliffs. Jimbaran is a surf spot with a selection of beaches scattered around the area, although it is arguably best known for its seafood restaurants. Running along the length of the beach here you will find a huge number of eateries all serving up the best catch of the day and you can order whatever looks good and then pay for your seafood by the gram. As well as dining overlooking the water with your feet in the soft sand, you can also swim in the seas just off these very same beaches and snorkeling and water sports are all popular pastimes here. 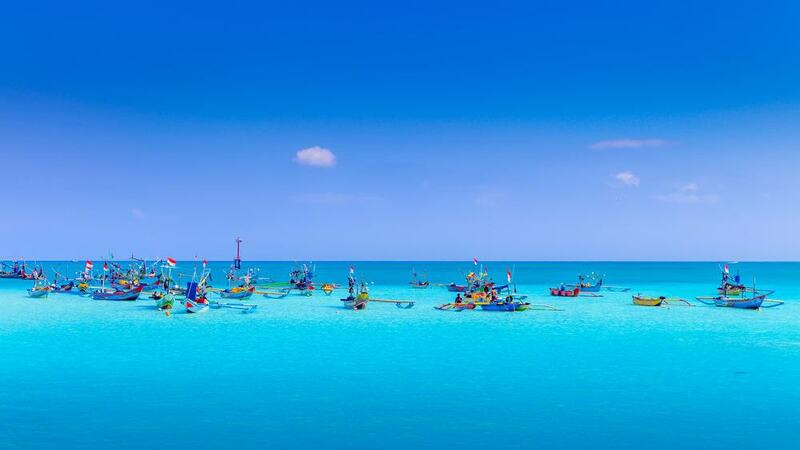 If you want to get out and about then Jimbaran is close to a huge number of attractions in Bali, and while it may not have many in its own right, it borders areas like Pecatu, Kutuh, and Ungasan which are known for their mix of top cultural spots like sea temples. As such, if you are in the market to venture slightly outside the center of Jimbaran then you will be pleasantly surprised by all the delights on offer here, and if you don’t fancy going too further afield, you can still enjoy the markets, golden sands, and slower pace of life in this lovely part of Bali. Uluwatu Temple lies just outside Jimbaran but it is widely considered to be one of the top attractions in the area. 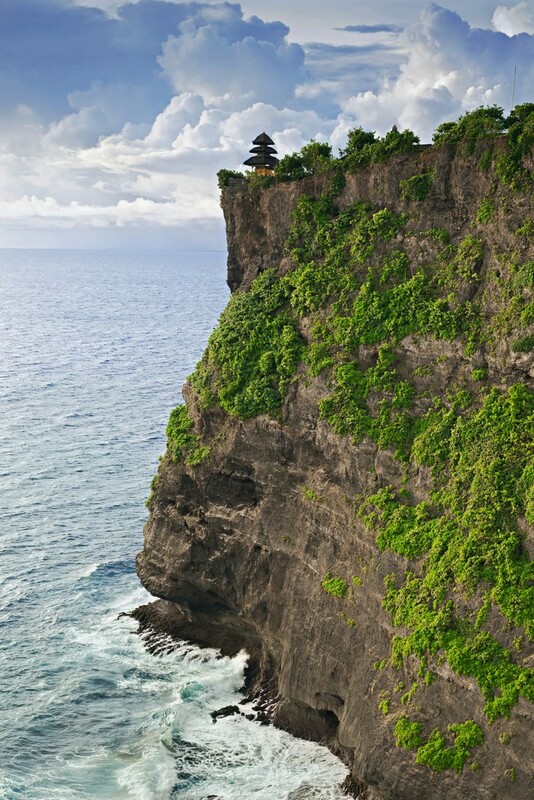 The temple is known as Pura Luhur Uluwatu in Indonesian and it is one of the most iconic sights on the island. The temple sits atop a craggy scenic bluff looking over the Bukit peninsula and is one of the most important sea temples in Bali. It is also surrounded by forest lands which are full of cheeky macaques who have been known to steal things from tourists so make sure to keep your personal possessions close to you as they are unlikely to relinquish pilfered items unless you placate them with fruit. 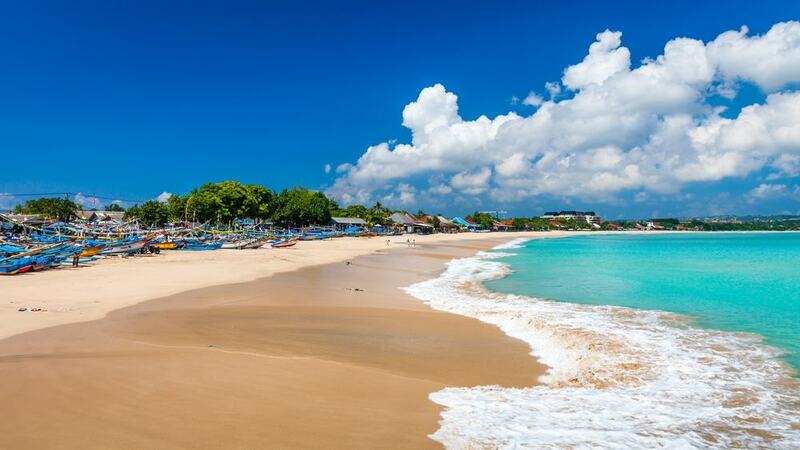 Widely thought of as one of the best beaches in Bali, Jimbaran Beach stretches for some 4 kilometers and is covered in clean sand and little local cafes called warungs. You can rent a sun lounger here and spend the day sunbathing, or get a bite to eat complete with a refreshing green coconut. Across from the beach is Jimbaran Bay which has a large coral reef that means that it is a good spot to surf especially for intermediate surfers as the waves are not as fierce as at other spots on the island. You can also rent a sponge board here and try body boarding if you are looking for something a little more relaxing. Warung Bamboo is one of the better known cafes in Jimbaran and is known for its clean surroundings and excellent food. The way to order is to simply choose what kind of seafood you would like to enjoy and staff will then cook it to order along with a range of side dishes of your choosing. They also, like most of the warungs here, have a special in house sauce that is perfect for dipping your seafood in. 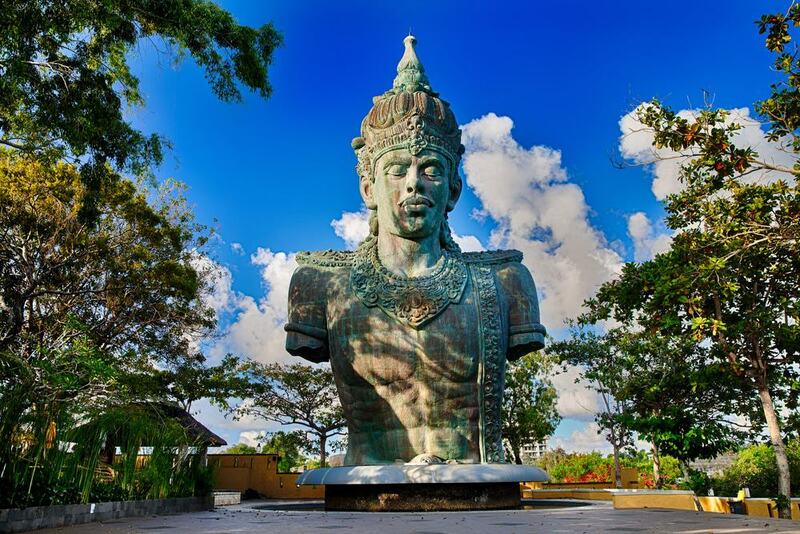 Garuda Wisnu Kencana is a cultural park which is sometimes colloquially referred to as GWK. The site is open to the elements and stretches across some 250 hectares of land in Ungasan which is just a few minutes’ drive from the center of Jimbaran. The main centerpiece of the complex is a large statue of Vishnu, an important Hindu god, atop a mythical Indonesian garuda bird. The site also has a range of stages where you can catch a cultural show and there are also music festivals and other art related events held here throughout the year. 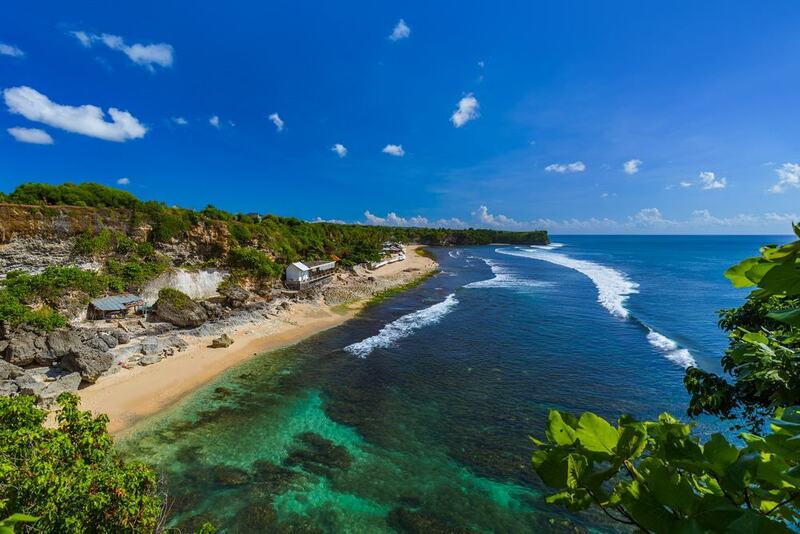 Also close to Jimbaran, in Uluwatu, is Suluban Beach which is one of the prettiest spots on the whole island. The beach is encircled by picturesque limestone rock formations and you will need to walk down a set of steep steps to access the sand. The beach is known as one of the best places to start from if you want to paddle out and surf at one of the main reef breaks just off the coast and the name means Blue Point in Indonesian thanks to the turquoise waters here. Jenggala Gallery is part of Jenggala Keramik which is one of the biggest and most famous producers of ceramics in Indonesia. 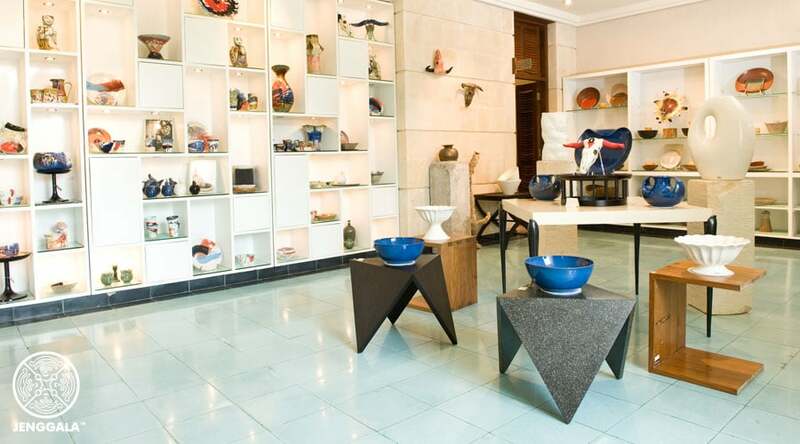 At the gallery you can take in the amazing collections of art work all made from ceramics, some by local artists and some by other big name international craftsmen and women. Next to the gallery you will also find a large showroom where you can buy some of your own pieces to take home as souvenirs, and there is also a pottery workshop where children can have a go at making their own pot. As if that wasn’t enough there is also a nice coffee shop here where you can relax with a drink after taking in the art work. Padang Padang Beach lies off the Labuan Strait close to Jimbaran and is one of the best loved surf spots in Bali. Here you will find a long strip of sand that you can get to by walking down steps cut into the rock face and you will find a consistent pounding surf here that brings in large barrels that are perfect for experienced surfers. If you don’t surf then you can still enjoy the beach and sunbathing is popular here or you can have a bite to eat at one of the local warungs serving up traditional Indonesian meals and snacks. Jimbaran is most famous for its fish, so with that in mind you can cut out the middleman and take a boat trip to try your hand at fishing yourself. 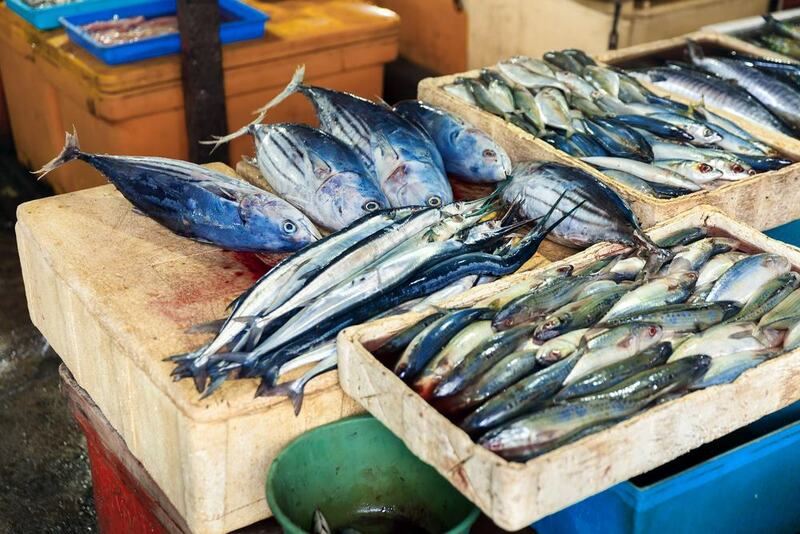 One of the best known companies in Jimbaran is called Bali Fishing Sensation and they will take you out on their boat called the Dewi Ocean where you can have the chance to catch your own fish including snapper, amberjack, and mahi mahi. There is also the chance to have anything you catch cooked for you according to your preferences and this is a wonderful activity for all the family as children are also welcome to have a go at trying to reel in a whopper for themselves. You can’t say you have visited Bali until you have tried one of the famous Balinese spa treatments on offer here. When it comes to spas, Jimbaran is no slouch and you will find a huge number to choose from in all the high end resorts. If you want an independent spa experience then you can head to spots such as Opium Beauty and there are also some good high end picks such as Bamboo Spa. Expect to choose from options such as relaxing massages using hot stones or aromatic essential oils, or you can also have traditional Balinese baths with flowers and herbs or a full body scrub. If you want to do some shopping in Jimbaran then the best place to do it is at Sereh Gourmet Supermarket. 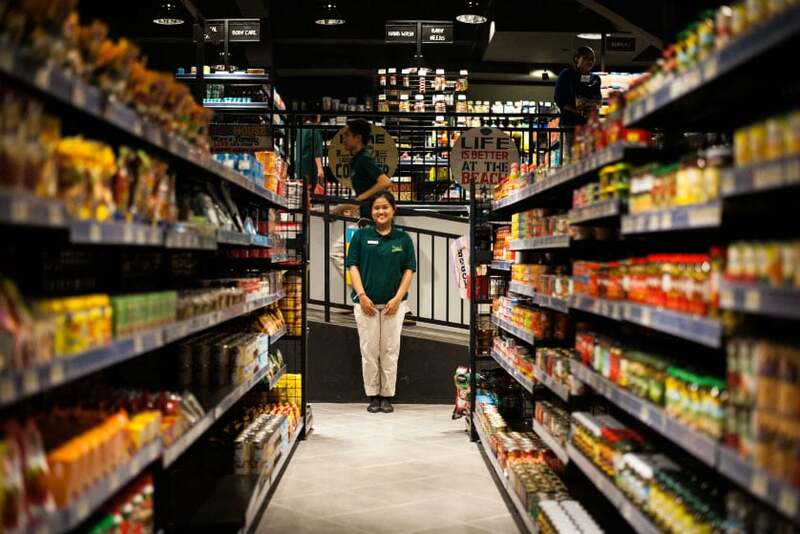 As the name suggests they have a huge range of upscale food items such as smoked meats and cheeses as well as a comprehensive wine and spirits section. You can also pick up other items here like spa products and swim wear and they even have gift items if you are looking for some souvenirs. One of the best things about the supermarket is that they also deliver and will take you back to your hotel with your shopping. 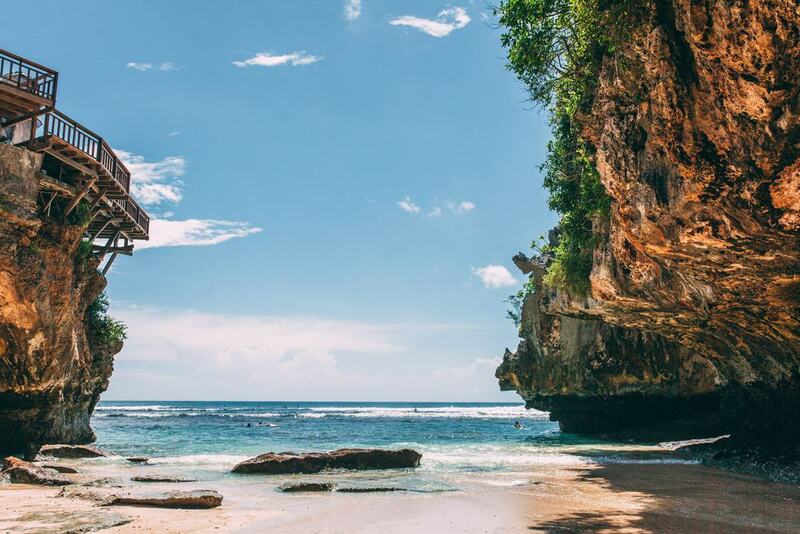 Pandawa Beach is often referred to as a ‘hidden beach’ in Bali which is all the more reason to make the effort to seek it out on a trip here. The beach runs for around a kilometer and is somewhat hard to find as it is encircled by pretty limestone bluffs. The beach is conveniently close to Kutuh Village in Jimbaran and you can check out the stone arches on the way to the sand which have Hindu statues in them that feature a different figure from the famous epic the Mahabharata. It is these statues that give the beach its name as they are known as the ‘Five Pandawa’. Despite the fact that the beach is ‘hidden’ you will still find a good range of amenities here and you can enjoy a selection of water sports such as snorkeling and parasailing as well as eat at one of the delightful beachside cafes that dot the coastline. The Morning Market in Jimbaran is distinct from the local fish market and here you will find colorful fruit and vegetables and other exotic oddities. 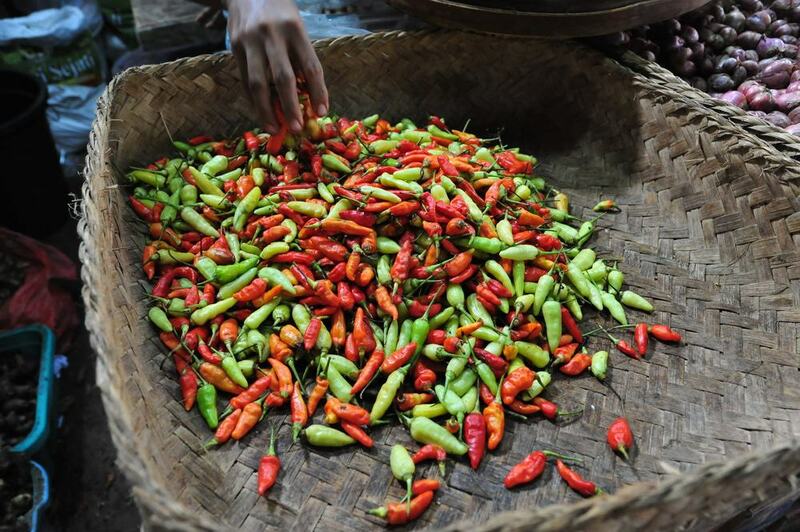 If you are looking for some of the best produce in the area then this is the place to find it and the market makes a great place to spend a morning wandering around and checking out the local food scene in Jimbaran. You will also find some vendors here selling typical Indonesian street food snacks. Jimbaran is known for its restaurants but one of these to look out for in particular is Warung Ramayana which sits on the sea front and looks onto a range of scenic wooden fishing boats. The main item on the menu is seafood and they use a special spice paste here which they rub on the fish in the morning and allow it to marinate all day long. 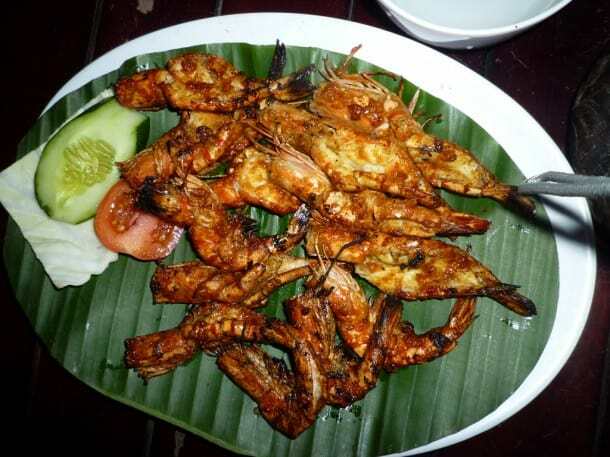 The fish is then grilled over coconut husks for a wonderful aromatic smoky flavor and prices are fixed rather than by weight unlike many other restaurants in Jimbaran so you can be confident that you are getting a good deal. 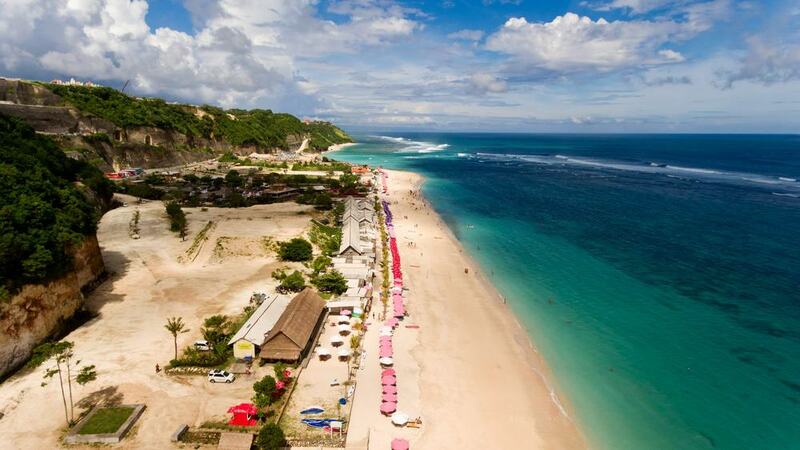 Dreamland Beach is now one of the most famous beaches in Bali and it is said to rival even Kuta Beach. On a trip here you will find a long section of golden sand which looks out over a colorful reef and this is a top spot for anyone who is an advanced surfer and looking for some challenging waves in a beautiful setting. If you prefer you can simply rent a sun lounger on the beach with a shady parasol and watch everyone else doing the hard work. Jimbaran Bay started life as a sleepy fishing village and although times have changed somewhat you can still get back to its original roots at Kedonganan Fish Market which is often also simply known as Jimbaran Fish Market. The market sits a little way back from the coastline and has the claim to fame of being the largest fish market in all of Bali. If you choose to come here then expect to find all manner of freshly caught aquatic life such as mahi mahi and red snapper. The best time to come is as early as possible when the boats come in around sunrise with the best of the day’s catch. 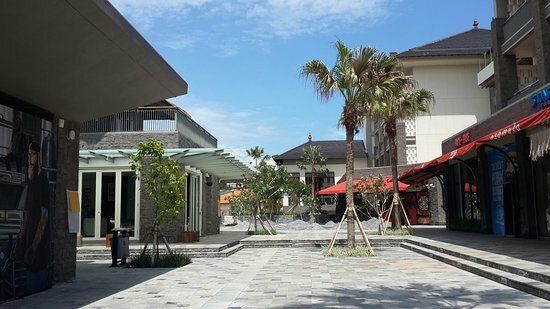 Samasta Lifestyle Village is one of the newest additions to Jimbaran and is basically a large shopping complex. Not only is the complex filled with shops where you can pick up gifts and souvenirs of your trip, but you will also find a huge number of restaurants and cafes including ice cream parlors and snack bars. Other amenities in the village include cocktail lounges and even hair and nail salons. 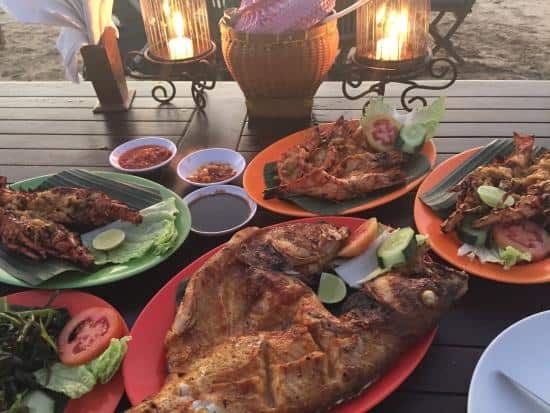 If you are looking for some cheap local food that is still delicious then head to Warung Bagus Cafe which lies at the north side of the southern group of seafood restaurants in Jimbaran. 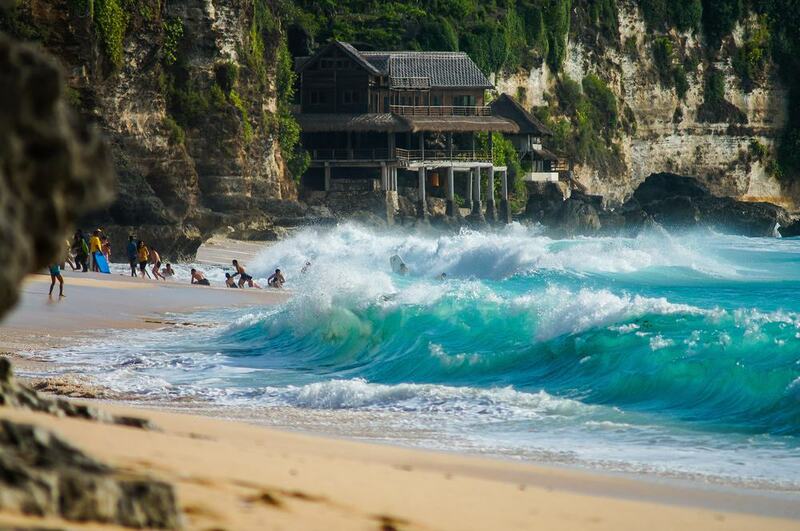 Balangan Beach is known for its surf breaks and many advanced surfers come here to check out the waves. 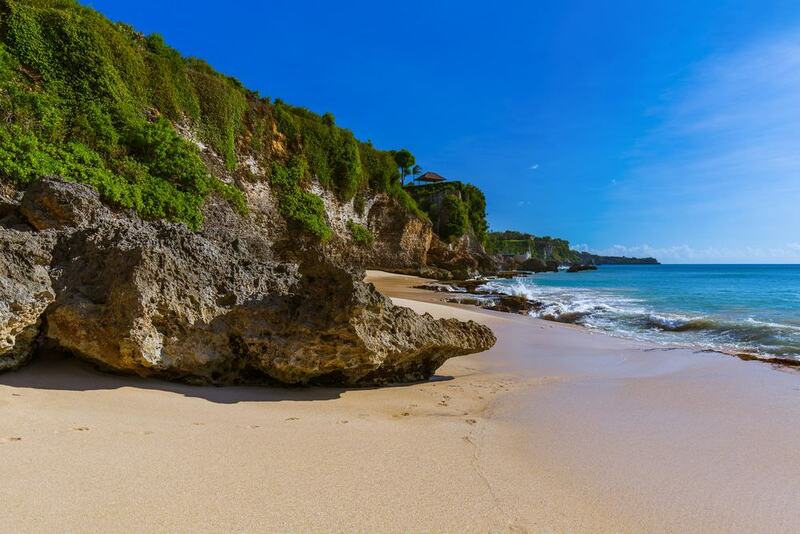 The beach is part of Pecatu close to Jimbaran and is easy to get to especially if you are also visiting Garuda Wisnu Kencana at the same time. As well as the surfing opportunities you will also find a number of cafes here serving hearty fare of rice and curries meant to sustain those who want to surf all day long. The sunsets here are also spectacular so if you like photography then be sure to head here in the early evening to make the most of the fiery vistas across the water. Jimbaran Town is more of a sleepy little Balinese village than anything but it makes a nice spot to explore in the afternoon if you want to get off the beach. The town is filled with little alleyways where you can browse and search the shops selling souvenirs and other oddities. One of the top activities that Jimbaran is famous for is the chance to make your own perfume. 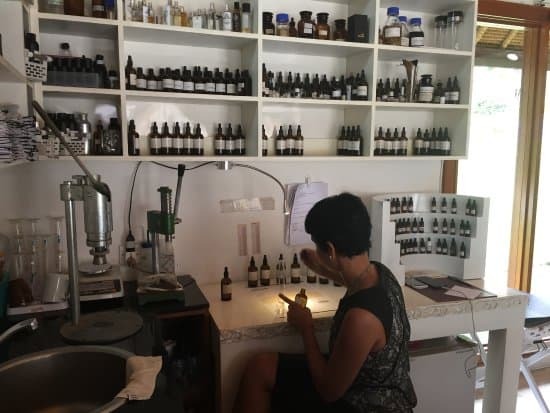 If you fancy having a go then you need to head to the L’Atelier Parfums et Creations where you will follow a gifted teacher who will teach you how to blend different oils together to make your own signature scent. This activity is perfect for the whole family as there is also a special kid’s workshop where younger visitors can also concoct their own aromatic creations. If you are looking for a luxurious way to spend the day relaxing in Jimbaran then you need to go to the Jimbaran Bay Beach club. The club is made up of a stretch of sand which also has an infinity pool that looks out over the water. You can then rent a sun lounger and parasol and spend the day eating and drinking from their extensive bar menu. 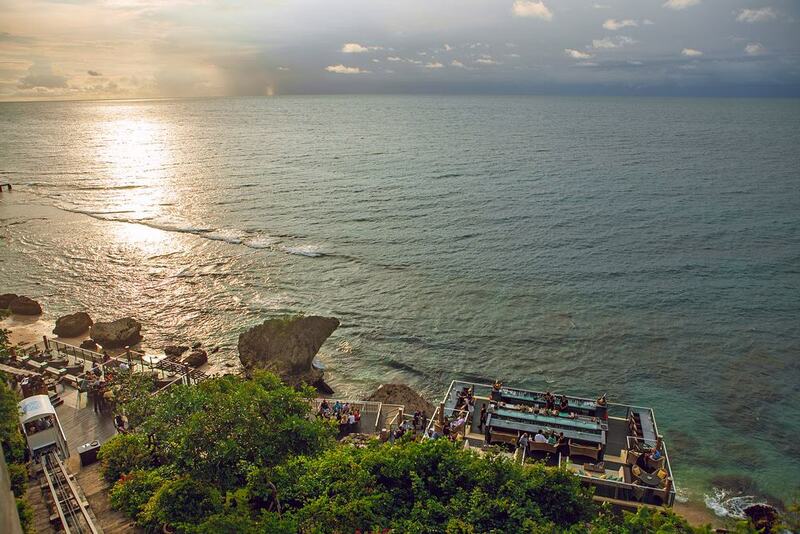 Rock Bar is one of the most famous bars in Bali which is no easy feat. The reason that it’s so famous is that it lies some 14 meters atop a cliff and looks down over the Indian Ocean. At sunset you can look out over the flaming sea and this is easily one of the most spectacular vistas in Bali. To get to the top of the bar you need to take a lift and once there you can sip on cocktails as well and snack on a Mediterranean bar menu. Pura Ulun Siwi is one of the main cultural attractions in Jimbaran and is located close to the Morning Market. Here you will find an 18th century temple made of black stone which is covered in flowers, offerings, and incense. One of the most interesting things about the temple is that it is said to have sacred waters that repel rodents and many locals come here to take the waters and use them on their crops to ward off any pests. 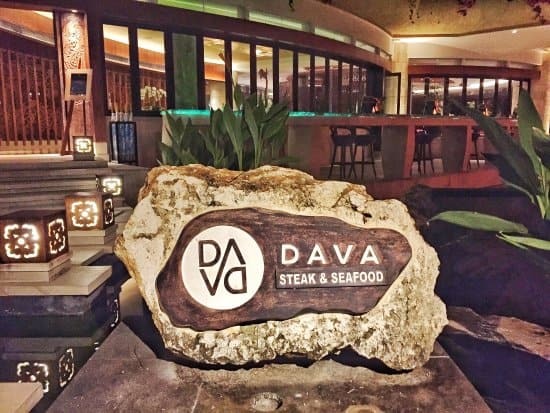 The Dava Bar & Grill is located at the AYANA Resort in pretty Jimbaran and is made up of a steak house and seafood grill. One of the best things about the restaurant is the views over the sparkling ocean below and if you can try to come here around sunset. 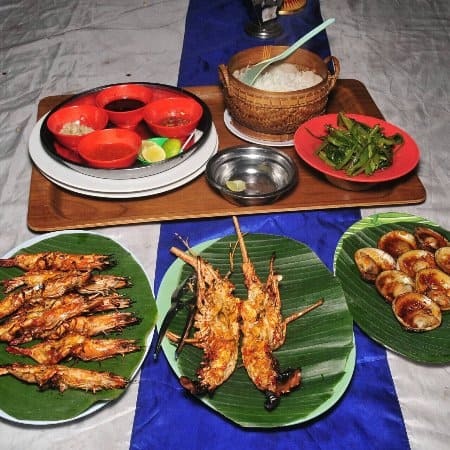 Just some of the specialties here include tenderloin steaks and delicious lobster and if you want to try an Indonesian delicacy then go for the Babi Guling or spit-roasted suckling pig. Bingin Beach is another favorite beach in the Jimbaran area, especially if you like surfing. The beach is backed by some large towering limestone cliffs and you will find a large reef break here which is perfect for advanced surfers. If you don’t fancy surfing then you can still swim and snorkel here or just relax on the soft white sand. Other popular activities at the beach include hiking along the cliffs which will give you gorgeous views over the water. If you want to stay longer then you can even stay on the cliffs as there are several villas for rent dotted along the coastline.